Enceladus transits Saturn’s enigmatic moon Rhea. Credit: NASA/JPL/Space Science Institute. Many of Saturn’s moons exhibit phenomena best associated with plasma physics. A faint ring of dust and rock has been found orbiting Rhea confirming the searing effects of electric discharges. Scientists from the Jet Propulsion Laboratory in Pasadena, California recently announced the discovery of a “debris ring” surrounding Saturn’s frigid moon, Rhea. The Cassini space probe, currently orbiting Saturn, discovered the signals that indicate a potential ringed debris field in 2005 with its Magnetospheric Imaging Instrument when the anion flux from the giant planet was seen to abruptly cutout on each side of Rhea’s disk. Geraint Jones, lead author of a paper that appeared in the March 7, 2008 issue of the journal Science wrote: "Until now, only planets were known to have rings, but now Rhea seems to have some family ties to its ringed parent Saturn." It comes as no surprise to find that Rhea has joined its sister moons in “flinging” great quantities of material into space. In a previous Thunderbolts Picture of the Day article about the “active” moons Tethys and Dione, features attributed to asteroid impacts were found to be the points where flowing currents of electricity touched down and wrenched particles into space. Today there is a less energetic process going on, but matter is continuing to be attracted along a circuit path to the plasmasphere of Saturn. Contemporary electrical interactions between celestial bodies are nothing like what must have taken place in the past. Rhea’s surface is fractured and carved in ways that point to surges of energy that were great enough to nearly destroy the moon. There appear to have been explosions big enough to rock the planetoid, but there are no boulders or blocks of stone that would be expected as a result of them. However, If electric arcs decimated the moon in the relatively recent past, the rock and ice were probably vaporized, torn apart into small pieces and then ejected into space. The ring of debris surrounding Rhea is most likely a clue to those events. Electrical theorists argue that Saturn moves within the plasmasphere of the Sun and interacts with the Sun’s electric field. Because planets and moons in the solar system are charged bodies that are not isolated in “empty” space, it is only to be expected that they would transact electrically with their primaries. The simplest, most straightforward explanation for the ionic plumes emitted by Tethys and Dione is electric discharge due to their position in Saturn’s circuit. There is no need to conjure implausible inertial dynamics (“tides” or “gravitational kneading”) to account for these remarkable events. 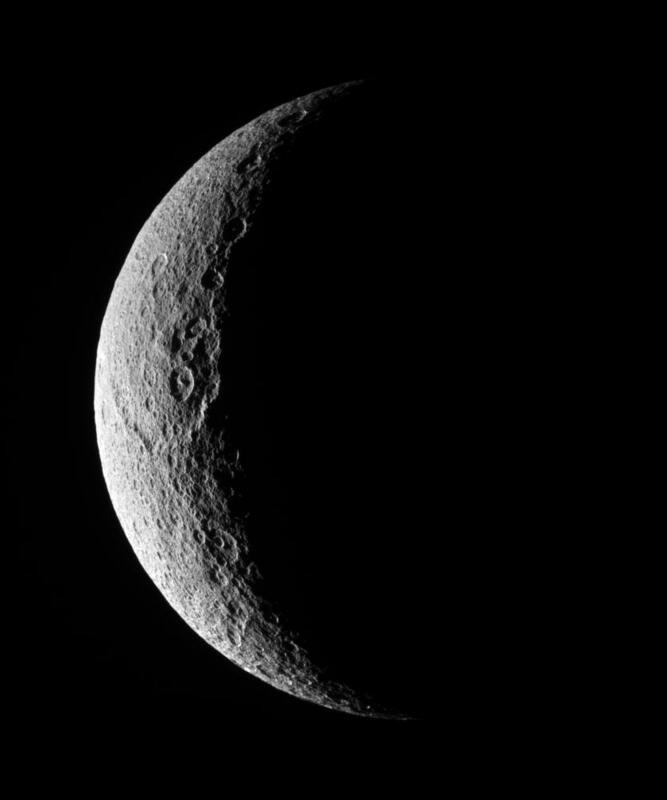 By that same token, the possible ring formation around Rhea is the remains of the pulverized rock and ice that billions of watts of electricity created when they catastrophically passed through the moon’s conductive strata. SPECIAL NOTE: We are pleased to announce a new e-book series "THE UNIVERSE ELECTRIC." Available now, the first volume of this series summarizes the failure of modern cosmology and offers a new electrical perspective on the cosmos. At over 200 pages, and designed for broadest public appeal, it combines spectacular full-color graphics with lean and readily understandable text. High school and college students--and teachers in numerous fields--will love this book. So will a large audience of general readers. 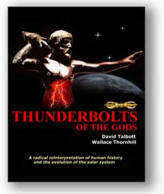 Visitors to the Thunderbolts.info site have often wondered whether they could fully appreciate the Electric Universe without further formal education. The answer is given by this exquisitely designed book. Readers from virtually all backgrounds and education levels will find it easy to comprehend, from start to finish.